55% of visitors to your website spend less than 15 seconds reading it before they leave. Social media posts are scrolled through at ever increasing rates and attention spans have fallen by 33% since the year 2000. Whilst digital platforms allow great personalisation and highly targeted ads, the fact that people are constantly exposed to them and have the aforementioned dwindling attention spans, how likely is it that you’ll remember a marketing post longer than it takes to press the share button? Be loud and be bold. Your leaflet needs to be striking and clear, offering something different. It should pique your target reader’s interest in some way. How you do this is up to you, but it can be done through humour, shock tactics, intrigue or just a striking visual appearance. Sticking with the PeTa leaflet above, the image is super-powerful in its own right but the headline is also strong and direct. The sentence instructs you with no politeness or beating around the bush and the poor bull looks you straight in the eye whilst you read. The cohesive way image and copy work together is what makes the leaflet so powerful. The image and text work hand in hand. The copy text is direct and lacks politeness markers such as “please” because this would weaken the message. The copy text puts the reader in a corner; if he/she goes to bullfights, he/she is happy to see a poor animal bleed to death. The headline says a lot in just four words. Following the instruction means the bull wouldn’t have died. If you’re considering attending a bullfight, you condone an animal ending up that way. 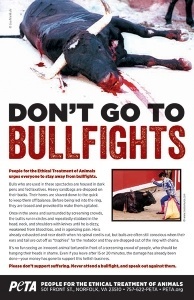 If you don’t personally go to bullfights, it’s that powerful of a leaflet that you feel guilty for not doing more. 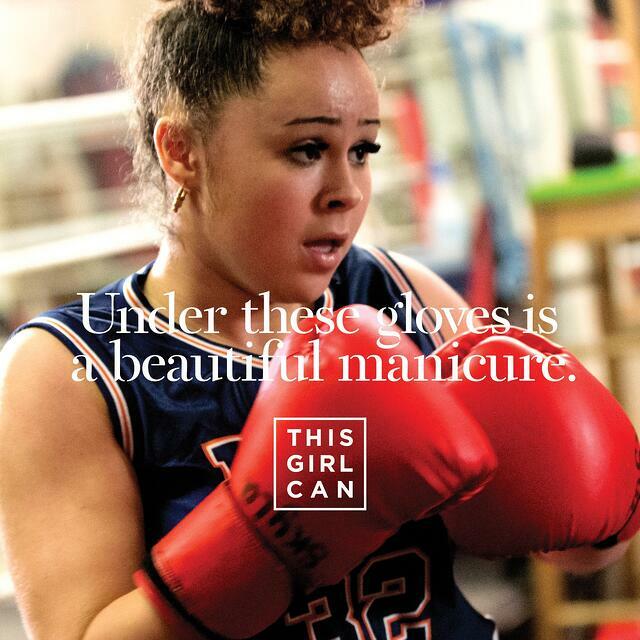 A completely different take on this, but just as brilliant, is the This Girl Can campaign. Aimed at encouraging more females to take part in sporting activities as part of a healthy initiative, the campaign shows women doing sporting activities which might impact on stereotypically female traits. We were going to show an example of bad practice for this point, but there’s no need to shame anyone in particular. The next time you are at a motorway service station or in a hotel reception lobby, take a look at the plethora of leaflets advertising local attractions. See how many of them don’t follow the first two points about getting the reader’s attention and saying a lot with only a few words. The vast majority of these leaflets will have been unable to resist cramming as much information as possible on the page and end up saying nothing at all. You can picture that leaflet display stand now, can’t you? There’s lots of pictures of museums, trains, countryside parks, theme parks, attractions… but what are they? What makes them unique? What are they called? They’re all just too repetitive and too familiar. They aren’t memorable at all. Either of the two leaflets pictured above would stand out a lot more than any of your information-overload leaflets which most marketers choose to print. Don’t be like most marketers. Be brave and look different. Whatever your competitors are doing and whatever the non-competitor leaflets you’ll be seen alongside are doing - do something different. If they’re all using plenty of words and little imagery, be brave and use a striking image or graphic illustration with little to no words. But if that’s what your competitors are already doing - try just a striking font in a vivid colour on a plain background. Standing out is the key to getting noticed. The first battle is getting seen. Without getting seen, it’s irrelevant what your content is saying. Remember that a leaflet is held in your hand, it’s not just seen in the middle of a Facebook newsfeed. Your reader will touch and hold your leaflet, so this is a great opportunity to stand out from the competition once again. Experiment with different stock types and weights in order to show you’re a cut above the rest. Even choosing something different from the standard lightweight, tri-fold, glossy paper will help make your leaflet feel different to the rest. It can be a subtle difference or something huge (how about an edible leaflet? ), but when handed a range of leaflets at an open event or charity day, for example, if yours is made from recycled card rather than standard paper, you’re already more memorable. Don’t try and cram all the information about your service, product or business onto one tiny leaflet. Nobody is going to read it all and it will end up going straight out with the recycling. Be clear that you only need two seconds of somebody’s valuable time. Invite them to find out more elsewhere, sure, but nobody wants a leaflet so keep the message short and don’t make somebody have to take time out of their day to read it. They’ll appreciate it and look on you more favourably in the long run. If you can make someone smile or feel shocked, they have invested an emotional response into your leaflet so will be more receptive to your wider message. The second benefit to drawing a reaction is you’re more likely to be worth mentioning by the leaflet reader. Somebody enjoying what you’ve done enough to say, “Ha, that’s good, have you seen this?” and then passing the person next to them your leaflet means that two people have consumed your message and are likely to talk about it further. Doing just another leaflet is not enough to be worth mentioning. You need strong design or a strong message or a noteworthy goal… or, ideally, all three. Lastly, don’t expect too much from a leaflet. If you’re a charity or company, it’s unlikely that people will convert into being a donor or customer off one piece of paper they’re handed out of the blue whilst they’re busy doing something else. Set a smaller goal for yourself and plan for the leaflet to be a stepping stone onto the next step of the reader’s journey. Invite them to follow you on social media or take part in a free online game. When they’ve done this, then you can market to them further. Leaflets can come in many shapes and sizes, and they can form part of a wider printed marketing strategy. This print campaign can work hand in hand with your digital efforts and has many options when it comes to materials and formats.